When Pinterest raised $US200 million in May and its valuation swelled to $US5 billion, it finally forced people to see the site as more than simply a spot for brides-to-be and cupcake lovers. As it has continued its advertising roll-out these last few months, the company has been moving towards a larger vision. At an engineering community event, Pinterest head of engineering Michael Lopp shared exactly that vision is: To fill the gap between an idea and a specific search. To help people find things they didn’t know they were looking for. 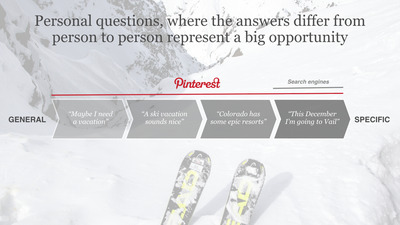 Pinterest wants to be the resource that users rely on when they have gotten the faintest glimmer of an idea. By pulling them into its ecosystem, it then wants to hook them until they’re ready to make to their final purchasing decisions, too. Getting users to start on your site whenever they want something is one of the “Holy Grails” of e-commerce. Google and Amazon are currently battling it out on that front: As more people start their searches on Amazon, Google has been ramping up its visual product listing ads to counteract the effect. Walmart also has a “semantic” search project, trying to serve shopping results to people who don’t quite know what they’re looking for. By taking into a step back and encouraging users to start their searches at that first inspiration phase, Pinterest is putting its hat in the same ring. 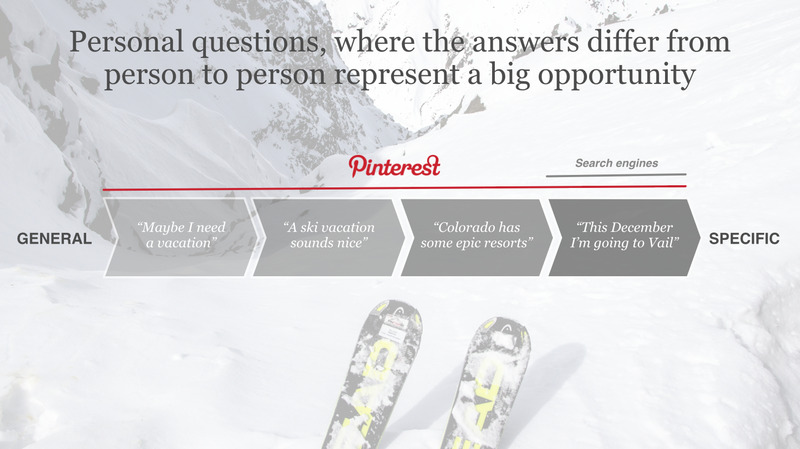 As a step towards that vision, Pinterest released Guided Search earlier this year to help users narrow-down results. For example, if you search for plants, Pinterest will show you a bunch of categories like garden, potted, outdoor, or hanging to help you more quickly and easily find what you want. If you are trying to plan the perfect birthday party and want to browse Pinterest for inspiration, a quick search could help you walk-through all of the details, from the cake to the party favours. Already, the company controls a whopping 23% of referral traffic to e-commerce sites, and by making it easier for people to find inspiration (and products) that they wouldn’t have necessarily found otherwise, Pinterest can keep that percentage growing. There are 30 billion Pins in the social network’s system and that number grows by 25% every quarter. The site’s backend gets 120,000 information requests per second and 20 terabytes of data logged each day. 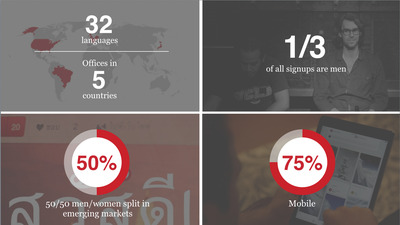 Pinterest is live in 32 different languages and 75% of its traffic comes from mobile. Lopp also address one of the major concerns about Pinterest’s audience: that all of its users are women. Although markets research company RJMetrics estimated that Pinterest’s male/female split was roughly 20/80 in May, Pinterest says it has doubled the number of active male users in the last year. 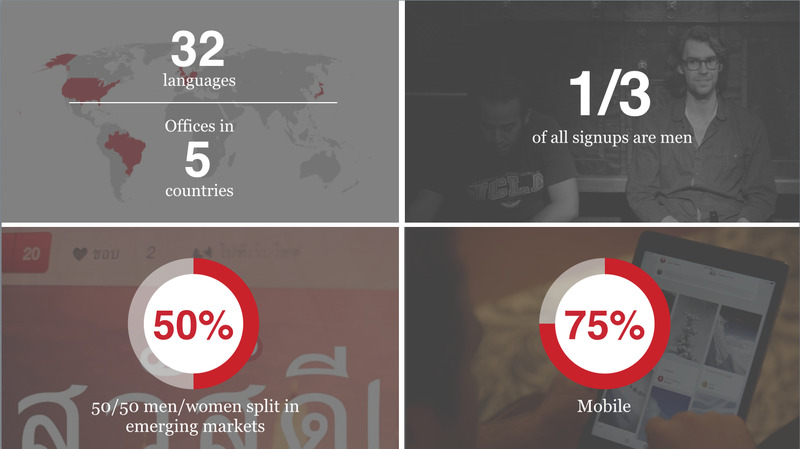 The company says that one-third of all sign-ups are men, and that its male audience is growing at a faster rate than its female audience. “More men are using Pinterest in the US than read Sports Illustrated and GQ combined,” Lopp says. The company added that in its emerging markets — like India, Korea, and Japan — the site is actually split about 50/50 with men and women.